DISCONTINUED--LIMITED QUANTITY AVAILABLE: A healing barrier balm made from rich organic shea butter, organic sunflower and apricot kernel oils with natural zinc oxide to help protect and soothe baby's tender bottom. 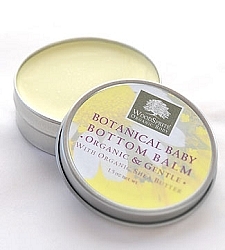 Apply balm to baby's freshly clean, dry bottom and diaper areas. Remove balm with warm water and a gentle natural baby soap or shampoo. "I want to rave about the baby bottom balm! My youngster had a nasty rash that all the petroleum goo couldn't help ... one application of the balm and boom! it was gone! The scent is awesome also- almost makes changing a diaper worthwhile... almost. thank you so much for your dedication to helping save the planet one wonderful product after another. --Gretchen M., Michigan"